There are two things I absolutely love doing: anything to do with cycling and ditto cooking. Ahead of today’s Gentlemen, I’ve been whipping up a few cakes to satisfy the hoards. In theory, it’s only around 150 cyclists and 20 or so volunteers. In practise it’s more as a lot of clubs will just happen to pass by the feedzone as part of their Sunday club ride. They’ll claim it’s to check on how their clubmates are faring. But no one’s fooled. It’s to sample my cakes. Cyclists here don’t have the same “coffee and cake” culture as in countries such as UK, US and Australia. They don’t need to stop and buy anything as it’s freely provided as part of the Sunday club ride. To be fair most clubs buy the cheapest cakes from the supermarket, typically madeira, ginger or fruit and serve them with a selection of biscuits, dried fruit and chocolate. My club’s USP is my home-made cakes. Because they’re so much nicer than supermarket ones, people, not unnaturally eat more. Some have been known to try a piece of each! Yesterday’s treat was a day out, on my own, in Sanremo to watch the thrilling finale of Milano-Sanremo. I like to drive over early, find a convenient and non-paying parking spot – see, I’m becoming very French – buy La Gazzetta dello Sport and settle down with a coffee to read what the pink pages have to say about the race. One of the things I love about cycling is its unpredictability. The Italian bookies had Cavendish as their favourite while Gazzetta mused that everyone would be riding to prevent him winning. I then had a pleasurable stroll around the shops and indulged in a spot of window shopping before taking up my position. It was windy so I was keen to find a place which afforded me shelter while still letting me enjoy the sunshine. I opted for the large screen after the finish and right next to the podium which was also opposite Rai’s studio – a grandstand seat. The pictures rolled and on the ascent of La Manie, Mark Cavendish (Sky) was almost immediately in difficulties. Word reached the front of the peloton who upped the tempo and distanced Cav. Faithful lieutenant Bernie “The Bolt” Eisel was sent back to keep him company while Team Sky deployed Plan B: Edvald Boassen Hagen. Queue the sound of money jingling in the bookies’ tills. We all had a bit of a heart stopping moment when the cameras alighted on a bunch of paramedics tending to an unseen fallen rider, on the descent of La Manie, who was later identified as the Columbian Carlos Quintero riding for Columbia-Coldeportes. Luckily he suffered only concussion and a broken collarbone but it had worryingly looked much more serious on the screen with active imaginations working overtime. The early breakaway group of nine riders, including the first Chinese rider to compete in this event Cheng Ji (Project 1t4i), which at one time had an advantage of around 13 minutes, were taken back on the Capo Berta with about 60km remaining. The hopes of a number of favourites were dashed by falls. The King of Belgium, Philippe Gilbert (BMC) was taken out of contention on the Cipressa while his predecessor to both the Belgian championship and crown, Tom Boonen (OPQS) was hindered on the descent of the Poggio. A couple of moves did go according to plan. Johnny Hoogerland (Vacansoleil) launched two unsuccessful attacks, Fabian Cancellara (RadioShack) bridged across to what proved to be the winning attack of Aussi-champ Simon Gerrans (GreenEDGE) and Tirreno-Adriatico winner Vicenzo Nibali (Liquigas) just before the summit of the Poggio. Now, if you’re going to follow anyone downhill, it might as well be either Fabian or Nibali. Gerrans was in great company. Cancellara opened a bit of a gap by the time the reached the bottom of the descent and was starting to motor away. 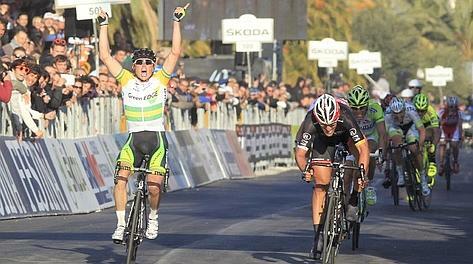 But Gerrans, knew what to do. He gave chase. This is where the script changes. Instead of Fabian leaving the two original attackers trailing in his wake, Gerrans worked hard to get back onto his wheel. To give Fabian his due, he continued to motor towards the finish when lesser riders might have quailed at the prospect of allowing the other two to ride his coat tails. Had he not done so, the trio would have been swamped by the peloton and the win would have been fought out by Peter Sagan and John Degenkolb. Instead, the three in-form riders headed to the finish line and Simon Gerrans had the smarts to ambush Fabian and take the win, making it successive wins for Australia. I was then courtesy of my position, treated to a grandstand view of the podium. I would have taken a photo had the battery not already run flat in my phone. It seems to last no more than six hours tops. There’s nothing else for it, I’m going to take a trip to Orange hell to sort it. I skipped away and back to the car, handily placed to get back onto the motorway ahead of all the peloton’s cavalcade of motorised transport and most of the other spectators. It had been a great day out.